United Grain Systems, a joint venture between United Farmers Cooperative and ADM, opens new high-speed shuttle loading facility. The purpose of a corporate mission statement is to define the reason the organization exists and to provide a framework for how it conducts business now and in the future; however, how firmly — and creatively — it sticks to this path is another story. The co-op’s commitment to this mission is affirmed by its mindful decision making; its dedication to customer service; a penchant for hiring the best talent; and its determination to roll out unconventional offerings, i.e., insurance and financial services. “Sure, at the end of the day we’re moving commodities, selling fertilizer, buying grain — it’s not fancy stuff — but it’s important stuff and it holds these communities together,” explains UFC’s CEO Jeff Nielsen. Also aligning with the institutional goals, the cooperative’s latest innovation, the creation of United Grain Systems (UGS), a 50/50 joint venture between UFC and Archer Daniels Midland (ADM), grew out of a willingness for both entities to think outside of the box. 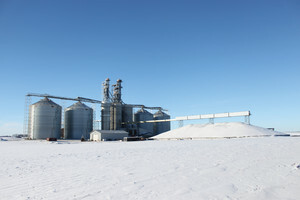 While UGS includes UFC’s existing grain division, this new business entity is hallmarked by a new 7-million-bushel, high-speed, high-volume shuttle loading facility in Brownton, MN. The story of this collaboration begins a decade ago in the cornstalk-laden fields surrounding the intersection of the highways MN 15 and U.S. Route 212. Nielsen, who grew up on a farm in rural Wisconsin and has worked for various agribusinesses professionally before joining UFC in 1995, credits having a life-long connection to agriculture for giving him “the opportunity to see how many things are done in many different ways,” and thereby broadening his perception and fostering a solutions-based mind-set. “During my first 10 years with the cooperative, we focused on making sure we were world class in whatever we did by investing in our facilities — such as our feed mills, fertilizer plants and an adjusted energy division,” he explains. Meanwhile, as the yields and volume increased year over year, growth of the co-op’s grain division happened organically. For example, in 2005 UFC’s five elevators handled roughly 6 million bushels; in 2011, the volume tripled. “While our feed business is robust, it wouldn’t grow at a pace to consume all the additional grain,” explains Nielsen. Logistics and storage began to pose a problem for the co-op — and there was no indication the volume would let up. At a board meeting in 2009, expansion of UFC’s Winthrop elevator was on the table, when a board member suggested that perhaps investing in a landlocked site without rail access might not be the best use of the cooperative’s resources. Download the Brownton, MN Feed Grain Article here.